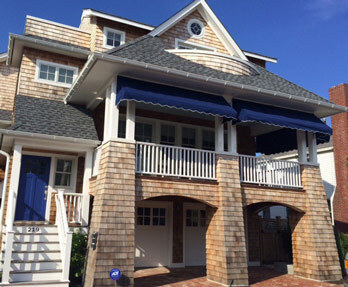 Stationary Fabric Awnings in New Jersey | Canopies for Decks, Patios, and More! Peace of mind. There are no motors or mechanical pieces to worry about with our stationary fabric awnings. All of our awnings are built to last, and the ones that truly hold up to the test of time are our stationary models. If you are in need of a permanent shelter over your deck, patio, gazebo or any number of outdoor structures Coastline Awning has the right products for you. Here at Coastline Awning, we offer a variety of patio canopies and other shade solutions so that homeowners can enjoy the outdoors without worrying about the harsh sun and UV rays ruining all the fun. Whether you want a patio canopy for your pergola, an attached awning for your deck that includes rain gutters, or a freestanding system, we have the right products for you and your property. Permanent shade for hot summer days. Our stationary awnings provide shade all year long with little to no maintenance. The best part about our stationary awning systems are their maintenance-free qualities. There are no moving parts or motors, so you can rest assured that your awning will function properly for years to come. We build all our custom stationary awnings with durability in mind. They can withstand wind storms, hails storms, and heavy rainstorms. Plus our exclusive 5 and 10-year warranties protect you from manufacturer defects for consistent peace of mind. 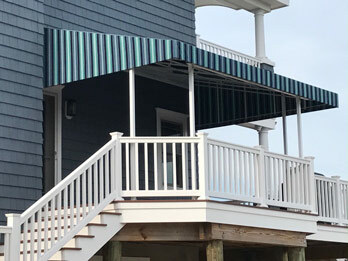 If you are in need of a stationary fabric awning for your home or commercial building, give us a call today at 1-844-707-7757 or contact us online for a free, no-obligation on-site estimate!